Comminution '10 was held in Cape Town last April, and 72 papers were presented over the 4 days, covering a wide range, including breakage fundamentals, modelling and measurement of mill action, mechanistic modelling, applied process improvement and updates on equipment performance. The International Comminution Research Association (ICRA) hosted a 2-day workshop prior to the conference to provide an update of the PEPT (positron emission particle tracking) technique, which provides an insight into the particle motion in realistic systems, and this led to many high calibre PEPT papers at the conference. 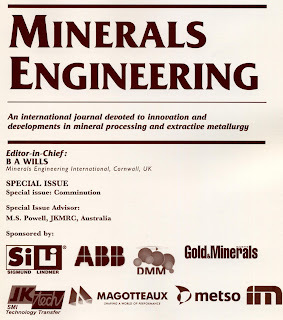 Twenty four of the papers presented were selected for publication in Volume 24 Issues 3-4, a special comminution volume of Minerals Engineering, and the papers can now be viewed and downloaded via ScienceDirect. Draft papers presented at the conference are available on CD from MEI. 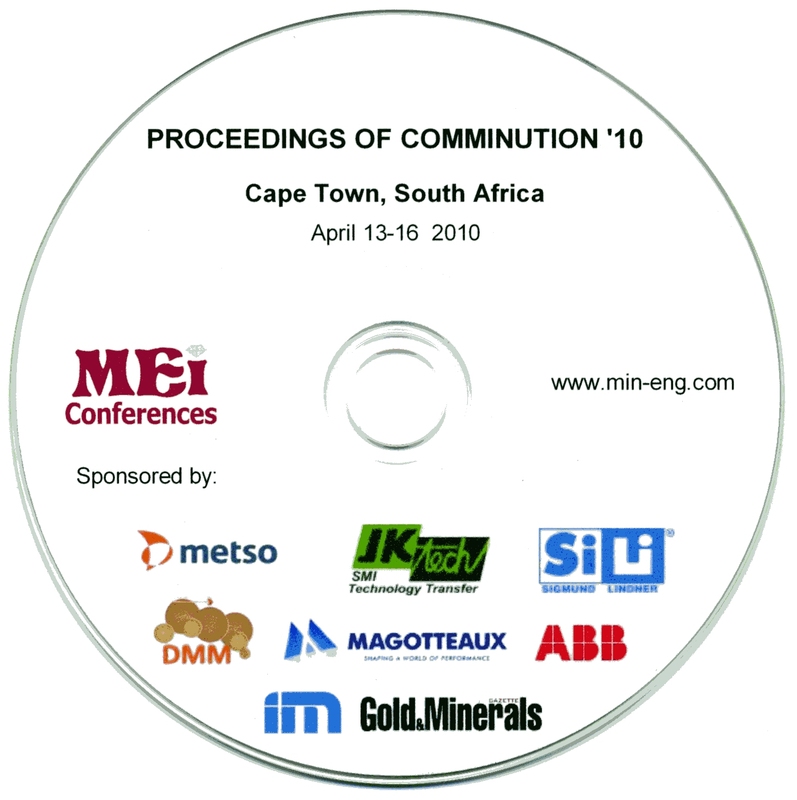 The next conference in the series, Comminution '12, will be held in Cape Town in April of next year. According to an article in today's paper, at 65 I can expect to live a further 22 years. A shame really, as I was planning to be active well into my 90s. But it did get me thinking about recent conferences that I have attended, and the number of people well over the normal retirement age who are still enthusiastically engaged in their work. It was particularly noticeable at the recent SME Meeting in Denver, where there were obviously many participants well into their 80, and some I suspect in their 90s. A notable octogenarian was my friend Fathi Habashi, Emeritus Professor of Laval University, prolific writer of books, who spends much of his life travelling around the world presenting lectures and courses. 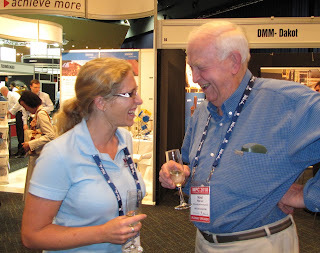 Last year's IMPC in Brisbane also attracted a large number of old-timers, including Birmingham University Emeritus Professor Noel Warner, again travelling the world presenting keynotes, and writing innovative scientific papers. It is great to see, but what is it that drives people to avoid playing golf every day or tending the garden? Is it because the minerals industry is the world's most important industry (blog posting of 10th January) or is it just that we are part of a very small, friendly community that we can't bear to leave? 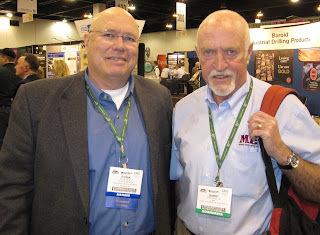 So who is the oldest active person in our industry? Let us know if it is you, or one of your colleagues or contacts. Every researcher who has submitted papers to reputable journals will be familiar with the peer-review system. When a paper is received by a peer-reviewed journal, it is first assessed by the editor. If deemed relevant to the journal, it is then sent to specialists (usually at least two) in the field, who assess its validity, originality and innovation and whether the underlying science is sound. 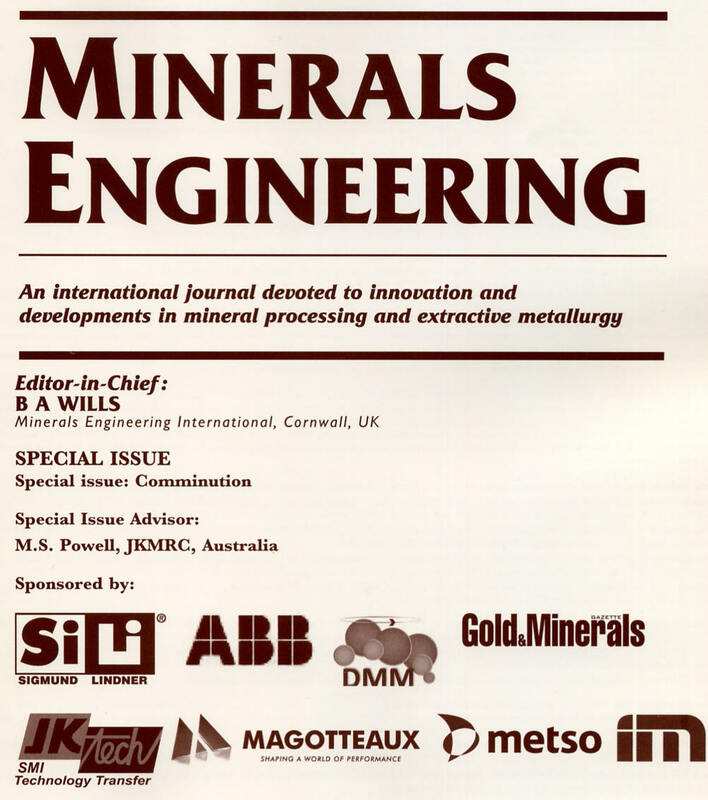 Most journals (including Minerals Engineering) adopt the single-blind review system, where the author’s identity is known to the reviewers, but the reviewers’ identities are hidden from the author. Peer-review is an essential dividing line for judging what is scientific and what is speculation and opinion. Innovative research usually has its own unique features, which are difficult to predict with a check-list and which require expert judgement about their validity, significance and originality. A major criticism is that in our world of instant electronic communication, the peer-review process is often frustratingly slow, usually taking several weeks, and sometimes months. As a journal editor of 23 years standing I do find the review process slow and cumbersome at times, but feel that it is the best system that we have, and does help to root out bad science and enhance the quality of papers that are finally accepted for publication. My main frustrations tend to be with reviewers who do not respond to invitations to review, thus losing a precious week, or, more worryingly, those who do agree to review but then fail to provide a report despite several reminders, adding weeks to the review process, as alternative reviewers have to be sought at a late stage. An independent report found that peer review is widely supported by academics, who overwhelmingly (93%) disagreed in a survey that peer review is unnecessary. The large majority (85%) agreed that peer review greatly helps scientific communication and believed (83%) that without peer review there would be no control. 90% of researchers said that the main area of effectiveness of peer review was in improving the quality of the published paper, and a similar percentage said it had improved their own last published paper, including identifying scientific errors and missing and inaccurate references. So what are your opinions on the peer-review process? What are your experiences, both good and bad, and how do you think it might be improved? I am particularly interested in the views of authors, but would also like to hear what reviewers and editors think. 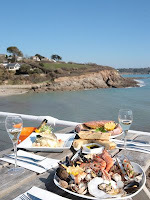 We have just been updating the Falmouth restaurant guide and Falmouth walks in preparation for this year's three MEI Conferences in May and June. Visitors to Falmouth are often surprised by the quality and diversity of restaurants on offer in this small seaside town, most within easy walking distance from the conference hotel. My favourite (and Barbara's) is Oliver's Eatery on the High Street, although when I have guests from outside Cornwall, I favour Indaba on the Beach, which has great food but also amazing views across the bay of the 16th Century Pendennis Castle. Falmouth's stretch of coastline between the estuaries of the beautiful Fal and Helford rivers is not to be missed and a short stretch of this coastal path is always a popular ending to the first day's presentations at the conferences. The MEI blog postings on Falmouth and Cornwall provide a good guide to the region's history, geology, things to do etc, and if you are hoping to attend an MEI Conference in Falmouth in the future you may wish to bookmark this, as additions are constantly being made to it. Marcos Goosens, General Manager Metallurgy & Processing at African Minerals, Brazil, today became the 1000th member of the LinkedIn group Minerals Engineers. Formed in May 2009, Minerals Engineers is owned by MEI and is the largest mineral processing and extractive metallurgy group in the ever popular LinkedIn. The group was recently switched to 'open', which means that discussions and comments can be viewed by anyone, and can be shared on the likes of Facebook and Twitter. Only members, however, can initiate discussions, add comments and post job vacancies and requests. Members can also choose to be alerted to new discussions and comments. Subscriptions to LinkedIn are free, so if you are not yet a member of the group, I urge you to join. If you are, I ask you to encourage your colleagues to join and make the most of professional networking. The awesome forces of plate tectonics have been all too evident in recent weeks in New Zealand and Japan. Only today I have received an email from a colleague at Tokyo University, who tells me that his apartment, 250 miles from the epicentre, feels like a 'shaking table' and there are severe jolts taking place every 30 to 60 minutes. I can't imagine how terrifying that must be. Cornwall has been shaped by the unimaginable forces of tectonic plates, and in an earlier blog posting (The Lizard Peninsula- a geological wonder) I described how the Lizard peninsula, a short drive from Falmouth, was formed around 300 million years ago by the closing of the Rheic Ocean. Today we walked from Poldhu Cove to Mullion Cove a beautiful stretch of the south coast of Cornwall. The cliffs which flank Poldhu are typical of the Devonian rocks which were laid down in Cornwall around 380 million years ago, but as we walked southwards towards the Lizard it was evident that these rocks had become more and more crushed and buckled by the advancing Gondwana continent, which finally closed the Rheic Ocean and squeezed up the Lizard. 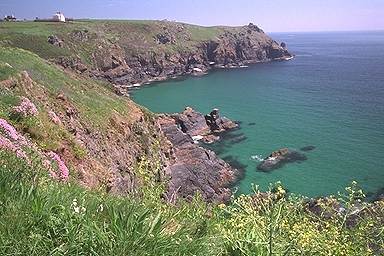 Polurrian Cove marks the geological boundary between Cornwall and the Lizard, the rocks on the north of the cove being Devonian slates, and on the south hornblende schists of the Lizard. 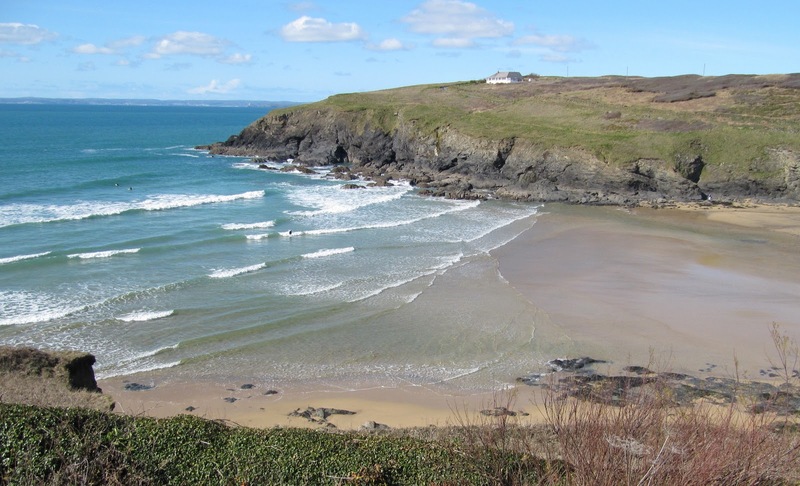 The boundary between Cornwall and the Lizard is also evident as one walks across the beach. Further on we reached Mullion Cove, and the first evidence of the serpentine rocks which characterise the Lizard and form the beautiful Kynance Cove a few miles to the south. I have been talking to Christophe Philippe of Magotteaux, one of our Comminution ’12 sponsors. Magotteaux is trying to establish if it is worth spending time, energy and money in developing a new type of crusher for intermediate and/or fine crushing stages (feed up to 150mm). 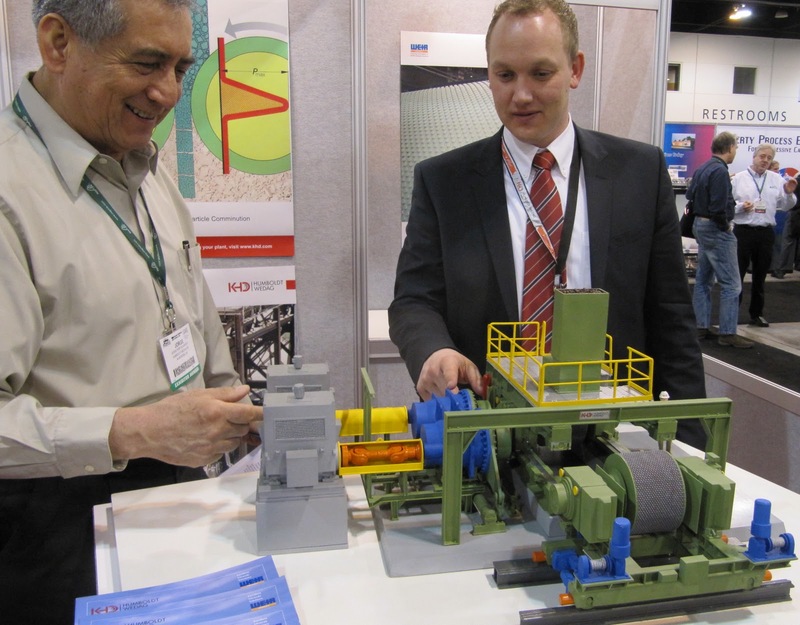 As a first step, the company would like to seek opinions on the shortcomings of current circuits (if any), the specification for the "ideal crusher", and feelings on the industry's openness to change. According to Christophe there have not been any real technological breakthroughs in crushing for a long time, apart from HPGR, most crushing circuits in the mining industry utilising cone crushers. 1 : Do you feel the Mining Industry is happy with the current crushing circuits ? 3 : If you could set the specs for a new type of crusher, what would they be ? - feed size (mm) : 150 mm or lower. 4 : If one could come-up with a crusher matching the specs above, how open would the industry be to change from current to new ? - what barriers to change do you see ? - what circuit constraints would affect the new crusher ? 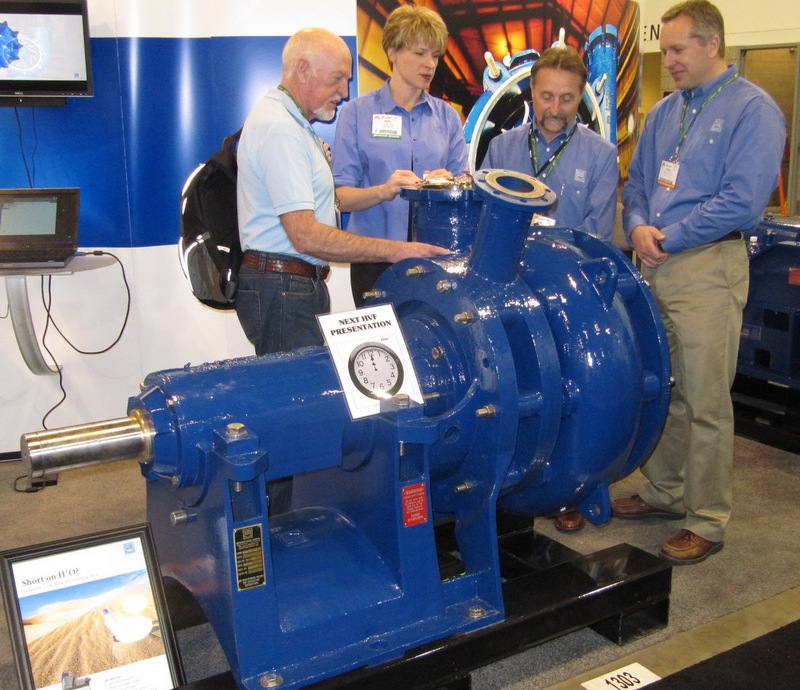 - what is the expected pay-back time for a crusher ? - would any positive impact on milling be taken into account when comparing new to current (eg more fines in the product) ? I invite your comments on behalf of Christophe. As I reported in my SME Conference Report, the 3rd edition of the SME Mining Engineering Handbook has recently been published. 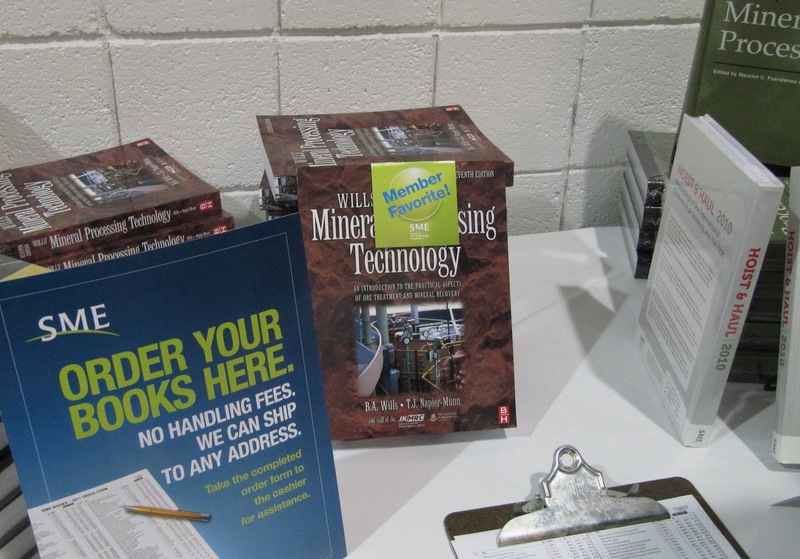 Virtually all of the information is original content, representing the latest information from more than 250 internationally recognised mining industry experts. The book has been edited by freelance writer/editor Peter Darling and full details can be found on MEI Online. I invite you to leave your own opinions and reviews of the book in the comments section of this posting. The annual Indaba conference was held in Cape Town last month. 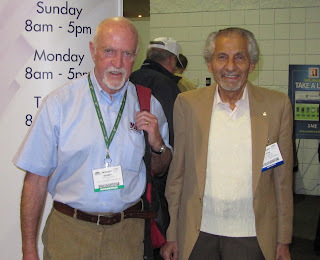 Unfortunately I was unable to attend this year, but two people who did have provided good reports on their blogs. You can read Mike Battersby's blog here and Gareth Hatch's here. If you attended this year's Indaba, your comments would be welcome. 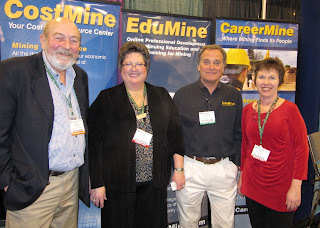 I am now in Denver, for this year's annual meeting of the Society of Mining Engineers. 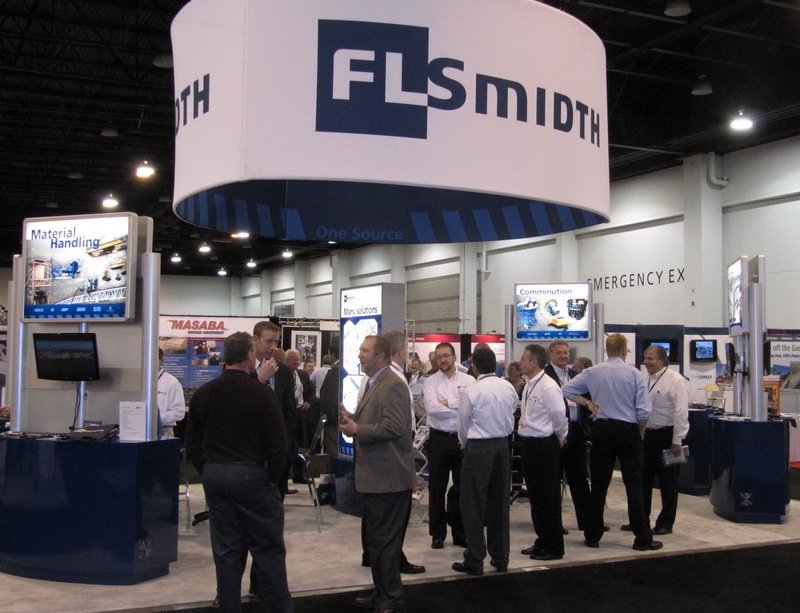 I have been to well over a dozen SME annual meetings, and always look forward to them with a sense of anticipation. I know many people who avoid them, as they feel that the events are characterless, and I have to agree that there is always a feeling of déja vu when entering the familiar soulless convention centre, with the layout of registration desks unchanging from previous years and cities. I also agree with many that there are too many papers lacking innovation, in endless parallel sessions. However the SME provides one of the great annual meeting places for minerals industry operators, equipment manufacturers, researchers and academics, and as such is an event not to be missed. 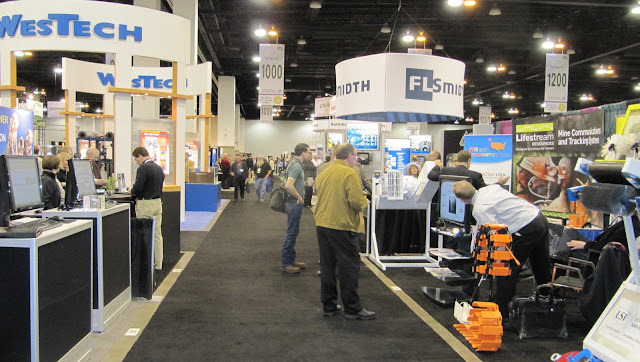 I tend to avoid most of the technical sessions and spend time wandering around the large exhibition, registration and book store areas, meeting up with old friends and always encountering faces from the past. As the SME does not publish a list of delegates in advance of the meeting, there are always welcome surprises in store. I am here until Tuesday lunchtime and in that time will be recording my personal diary of events, so this is not meant to be a definitive report of the meeting. I invite all those who attended to add their own experiences and views in the comments section at the end of this posting. Downtown Denver is the most pleasant of all the SME venues, and this morning I registered early and then Barbara and I took our usual walk from the mile-high steps of the State Capitol down the attractive 16th Street Mall. Around 3500 delegates have registered in advance of the meeting, compared with just over 3000 last year in Phoenix. InfoMine is the largest minerals industry web site and I met up with their team at their booth. They now run courses on various aspects of the minerals industry and we talked about associating these with relevant MEI conferences. 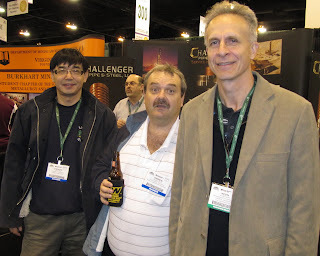 Moving on, I met up with Zhenghe Xu of the University of Alberta, Andrew Vince of Elsa Consulting Group Australia, and Kevin Galvin of University of Newcastle, Australia. Zhenghe is a reviewer for Minerals Engineering, and Kevin is a member of the Editorial Board. I called in at the Outotec booth, to talk to our sponsors of SRCR '11 and Flotation '11. It was good to meet Misty Dobbins, Marketing Communications Officer for North America, pictured 2nd from right in the photo in front of the 1/20 scale Outotec grinding mills, one equipped with the new turbo pulp lifter. 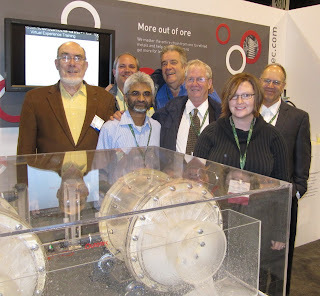 It was also interesting to hear from the Global Mills Technology Manager, Sanjeeva Latchireddi (3rd left) who I have known for some time, that he was one of my students when I taught a course in mineral processing at the Indian School of Mines in 1989! 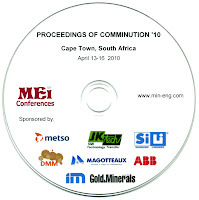 International Mining are media sponsors for MEI's Physical Separation '11 and Flotation '11 conferences. They have had their best first quarter ever in terms of advertising commitments, which is surely a good indication of the state of the industry. Pictured are Phil Playle, Paul Moore and John Chadwick. 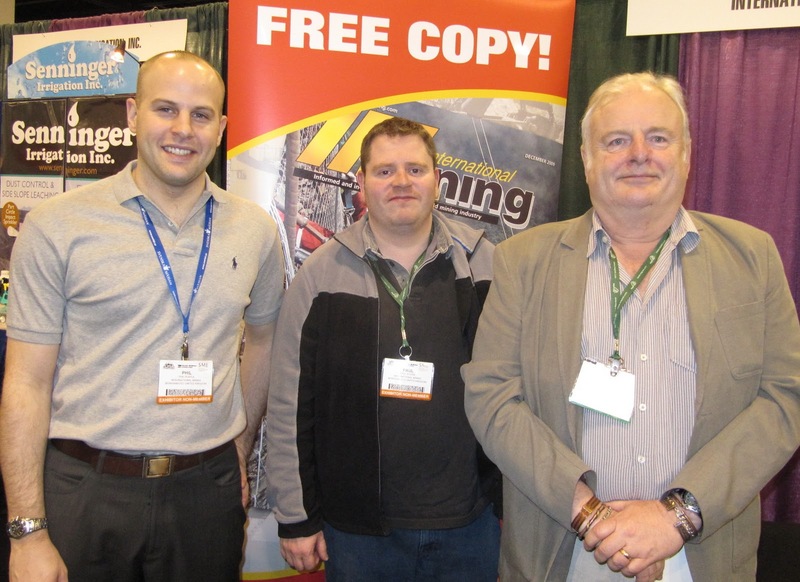 Paul joined International Mining in December and he was previously editor of Mining Magazine from 2006. 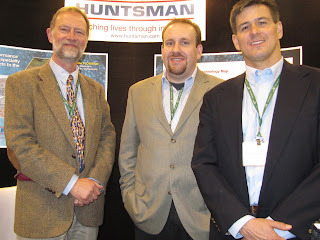 It is a number of years since I last saw Steve Hearn, who is now with Huntsman in Colorado. He is pictured below left with Herninio Muchon and Noah Denson. Huntsman are involved with flotation and hydrometallurgy reagents, particularly with higher strength frothers with high flash points. They also manufacture depressants for pyrite, talc, clays etc. While at the Huntsman booth I caught up with Erik Spiller, an old friend and now Professor at Colorado School of Mines. Not too many familiar faces in the registration area this morning. I have to keep reminding myself that although there are over 3500 people here, there may be only around 200 mineral processors. While waiting for the exhibition to open at 11am, I did manage to talk to Janusz Laskowski, who is presenting this afternoon's Gaudin Lecture, and Greg Hope of Griffith University, Australia. 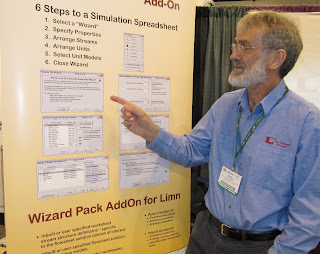 It was good to see David Wiseman of Limn "the Flowsheet Processor". 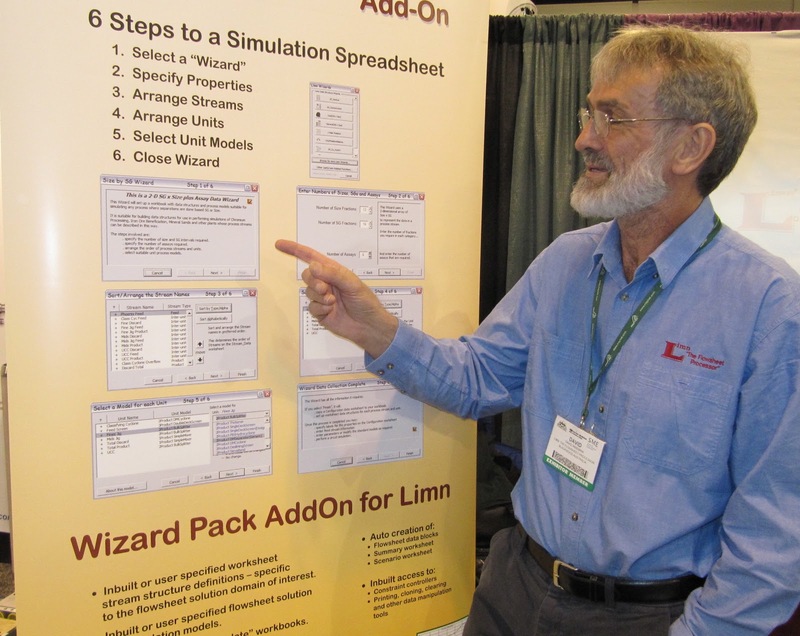 He tells me that a new version of Limn has been developed, which is compatible with XL 2007 and 2010 and is currently being beta tested. More news will be on MEI Online when available. David's company is now associated with Bratton Engineering & Technical associates, USA, who will handle marketing and support in the US. 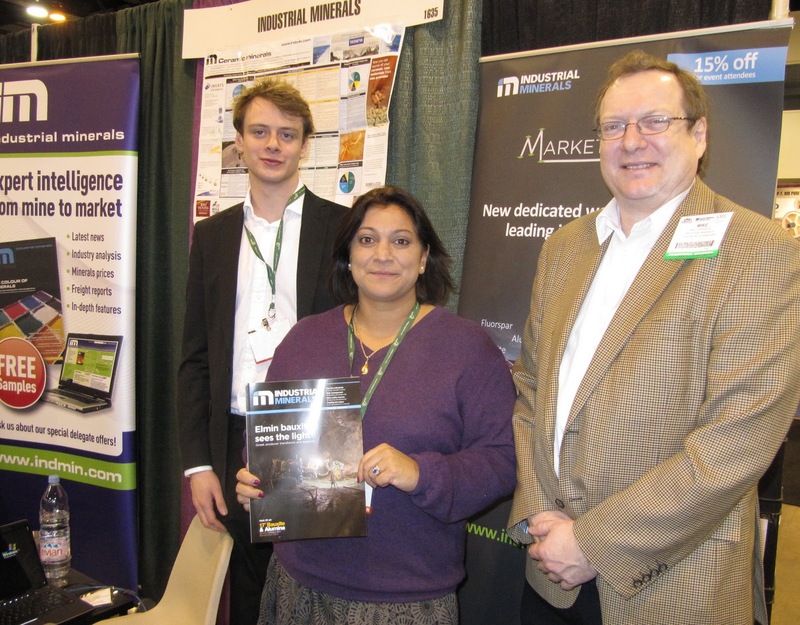 Industrial Minerals magazine is a media sponsor of 3 upcoming MEI Conferences, and were represented by Hamish Dobson, Ismene Clarke and Mike O'Driscoll. 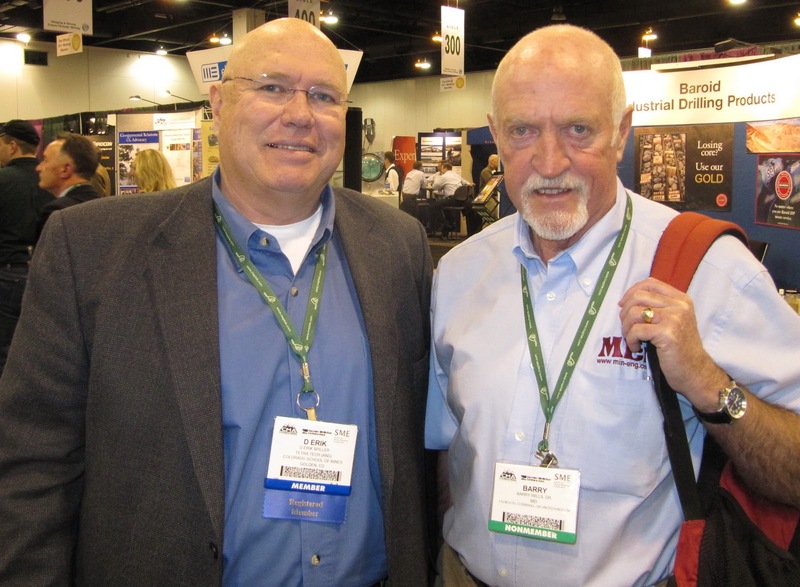 Mike will be awarded the Hal Williams Hardinge Award at the SME, for services to the minerals industry, particularly for reporting on the Chinese industrial minerals industry. He is only the 4th Britain to achieve this award since its inception in 1952. 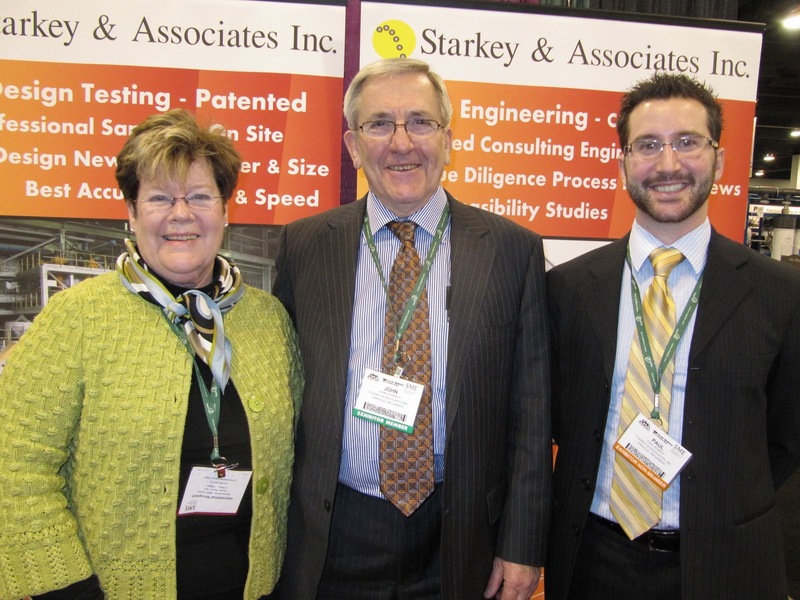 Starkey & Associates are sponsors of Comminution '12. John and his wife Donna and Paul Scinto are pictured in their booth. They have a new SAG mill at Inspectorate Labs in Vancouver, and a mill at Plenge in Peru awaiting commissioning. John is increasingly involved with consultancy and is currently working with Apogee Minerals Inc to assist in the redevelopment of the Pulacayo silver-lead-zinc deposit in Bolivia. He has also been hired by Claude Resources to supervise the testwork programme for development of the Amisk Project. I called at the OSIsoft booth to see Osvaldo Bascur and his assistant Mariana Sandin. 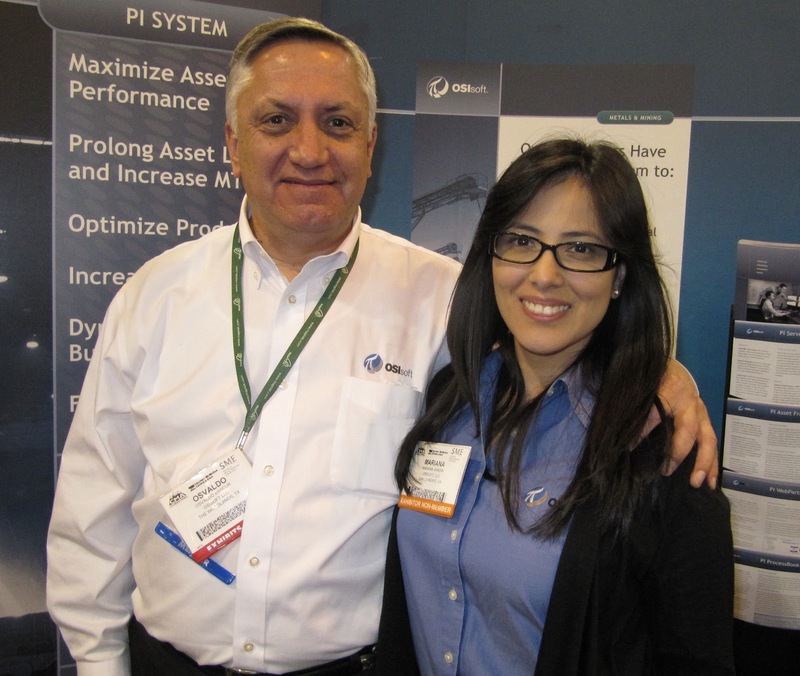 The new PI System which optimises the dynamic performance of mine to mill uses the latest data mining technologies. 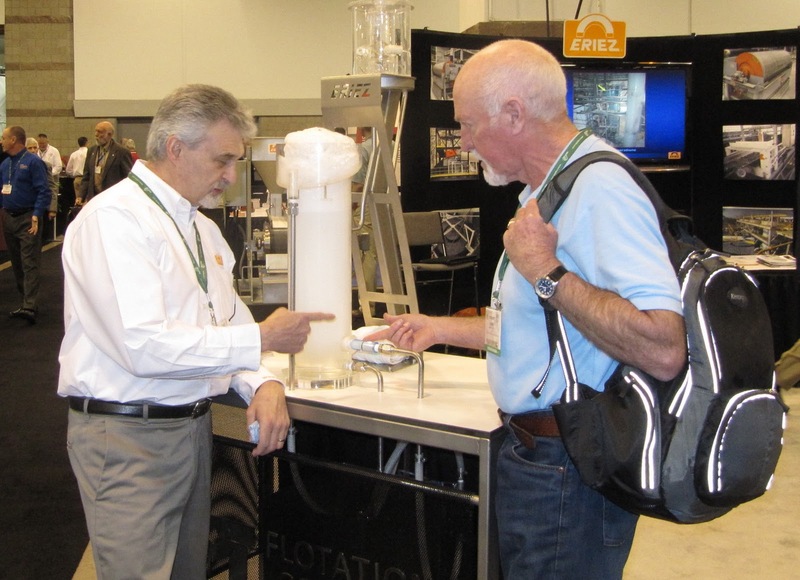 Hopefully Osvaldo will be presenting a paper at Flotation '11. 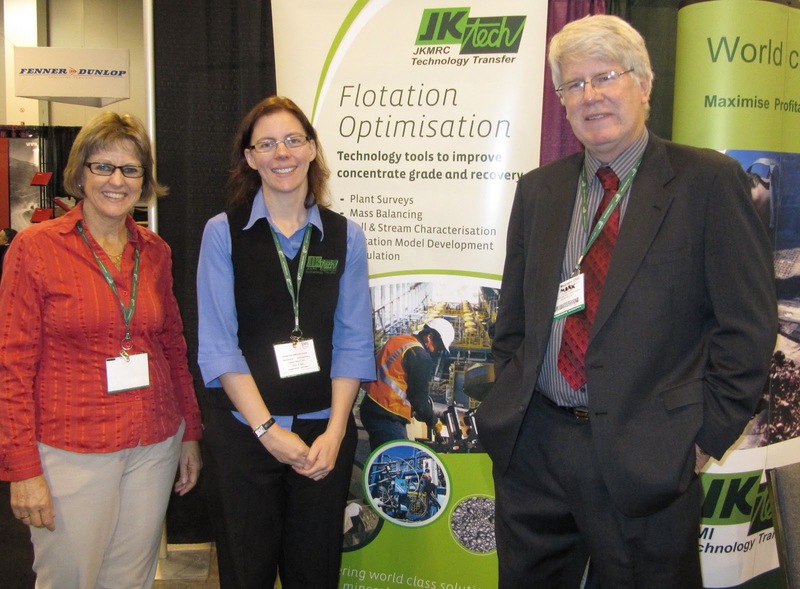 JKTech of Australia are serial-sponsors of MEI Conferences, and are very much involved with short courses and ran their Mine to Mill Process Optimisation workshop over the weekend attended by 26 delegates. They will run 3 courses in association with Flotation '11 and full details will soon be on MEI Online. In the picture are Mark Richardson, Dee Bradshaw and Sara Schwarz. Major lectures from the Mineral & Metallurgical Processing Division were presented in the afternoon. 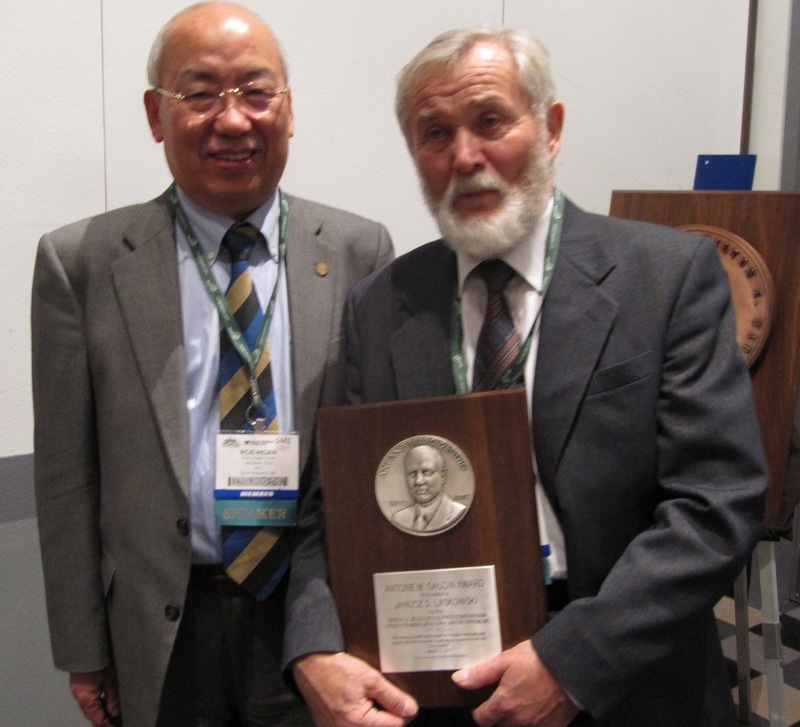 This year's Gaudin Lecture was given by Janusz Laskowski, Emeritus Professor of University of British Columbia, Canada. His lecture had the lengthy title "From amine molecule adsorption to amine precipitate transport by bubbles: a potash ore flotation mechanism". He is photographed with Roe-Hoan Yoon (left), of Virginia Polytechnic & State University, who is honoured by a Symposium in his name which starts tomorrow morning. The Richards Lecture was given by Gary L. Simmons of G.L. Simmons Consulting, USA. "Then and now 1972-2011"
The Wadsworth Lecture "Platinum group metal extraction" was given by William Davenport, Emeritus Professor of the University of Arizona. I invite comments on these lectures from those who were present in the packed lecture room. The greatest mine rescue of all time took place last year in Chile. The San Jose rescue of the 33 trapped miners was world headline news, and a highlight of the SME was a question and answer session with the major personalities involved in the rescue. This unfortunately clashed with many of the parallel technical sessions, including the Gaudin Lecture. This was surely important enough, and of such general interest, to have warranted a plenary session. A life-size replica of the Phoenix 1 capsule, which brought the miners to the surface, was on display in the exhibition hall. In the photo Dee Bradshaw experiences the confinement of the rescue capsule. I called in at the popular SME Book Store this morning, and was naturally very pleased to see that my book Mineral Processing Technology is the SME's best seller. 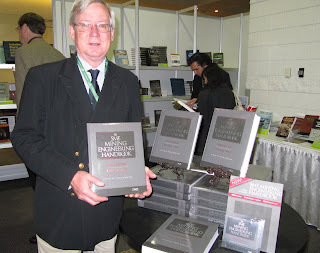 I was also pleased to see that the seminal SME Mining Engineering Handbook has recently been published in 3rd edition, incorporating all aspects of mining and mineral processing. Full details of the book will soon be on MEI Online. I was also fortunate to be recognised by the editor of the handbook, ex-Camborne student Peter Darling, who I have not seen for many years. Editing such a volume must have been a mammoth task, collating the information from over 250 internationally recognised mining industry experts. As before, I invite comments from those who attended any of these sessions. Then on to a final walk around the exhibition hall. 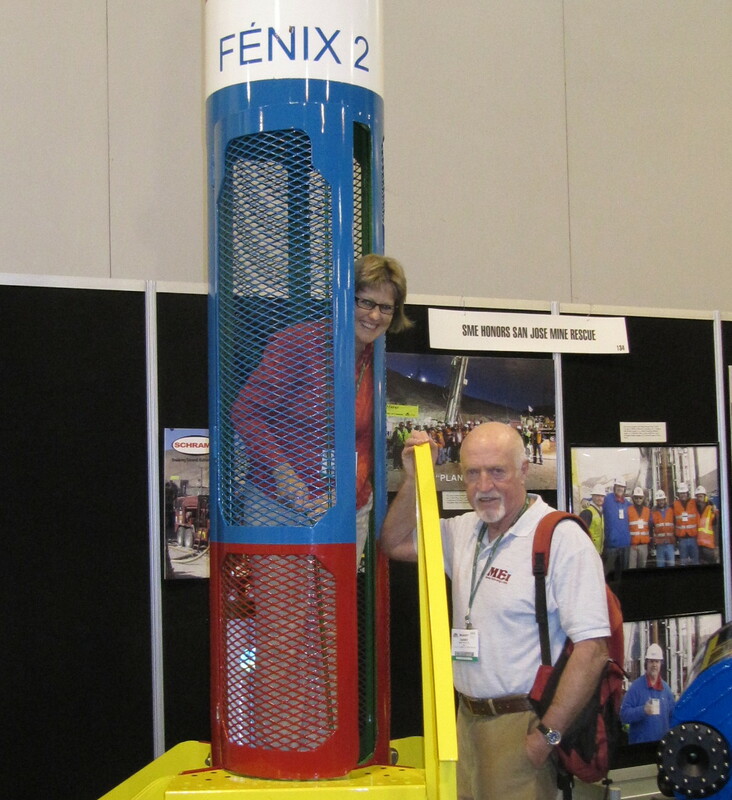 I met Joe Querin of Eriez Flotation Group (below left) and had a look at their column flotation cell. One of the big problems in flotation is pumping froth, but GIW of USA (below right) claims to have solved this problem with the HVF Pump, which gives the air a path out of the pump. They hope to display this at Flotation '11 in November. KHD Humboldt Wedag is one of the world's leaders in high pressure roll presses, and have recently installed 4 units in CAP Mineria in Chile and 2 in SNIM in Mauritania. They showed me their small model of a HPGR installation. Before leaving the exhibition hall I spoke to Starla Jackson of FLSmidth, one of our Flotation '11 sponsors, who was of the opinion that this has been one of the most successful SMEs, and judging by the number of people who were always in their giant display, I have to agree with her. Finally I manage to see Tara Davis, SME's membership and marketing manager. She told me that at Tuesday lunchtime over 5200 people had registered, making this one of the largest turnouts in many years. I have thoroughly enjoyed my two days at the SME and will certainly be at next year's meeting in Seattle. Once again I invite your personal comments on this year's event.